Meta Knight might as well be nothing but speed, and to most competitive players (Speed>Power), that makes him the best character around. He might not run or jump fast, he may be lightweight and weak, but many of his attacks only last a handful of frames. His attacks are superiorly, obnoxiously, and ridiculously fast. Although he doesn't possess the single fastest attack in the game, he undoubtedly is the quickest overall. Five multi-jumps boost his aerial game and recovery potential. Can glide; only Pit and Charizard can do the same. Multi-jumps piled with gliding and his Up Special give him amazing horizontal recovery and impressive vertical. Very short, making him harder to hit. His Down Smash's speed is godly for a KOing move, has several ways of being unleashed, and strikes on both sides. Forward-air and back-air are edgeguard and combo well, down-air spikes weakly, up-air juggles well, and Neutral-air KOs well. Many moves have a wide arc for his size, especially aerials. Sword gives most of his moves a disjointed hitbox. Strong in the combo department. Simple moveset makes him easy to learn; popular choice. On the lighter side, making him a target in Free-For-Alls. Many multi-hit moves that are easily SDIable. Has trouble fighting against competent campers. Has a rather long 32-frame delay before he can meteor cancel. Meta Knight is best in a 1-on-1. If you find yourself in a huge mob of people, it's best to get out of there. In a 1-on-1, Meta Knight rules the stage, his Dimensional Cape leaves his opponents guessing, and can be used to dis-orientate them. But in a huge mob of people, Mach Tornado is also a good way to get out, as you can control it while you attack. Another thing to remember is Meta Knight has no projectile attacks, so on Heavy-class/Slow characters such as Bowser, Ike, King Dedede, and a few others who are weak to projectiles due to their lack of speed; combos are the way to go. Hold in the attack button to unleash a horde of strikes. Oddly enough, this isn't his fastest ground attack in either start-up or after-lag. Its range and damage aren't great either. Although its duration can come in handy for side-steppers, Mach Tornado or his triple-hit Forward Tilt can do the job just as well, if not better. The only real time to use this is pinning a foe against a wall. Down Smash is definitely better for spacing at low damages. Triple-slash: one of Meta Knight's most prominent standard attacks. It builds up decent damage compared to his typical strength, and you can adjust its duration to suit your needs, depending on how fast you tap the button (you could even just tap it once for a fakeout-into-grab). The third strike even launches the foe upwards, which you could use to unleash aerials. This move only has two real weaknesses: The fact you can't use it on the move, and the after-lag compared to his other moves. 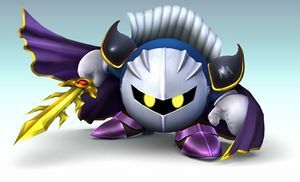 Meta Knight thrusts his sword upwards. It's slow, has a limited range in front and behind, and doesn't do much damage. His C-stick smash covers the same area but has more range, launches in the same direction but further, is faster, does more damage, and you can do it out of a dash, so there's no reason to ever really use this move. You'd think combo, but its after-lag says no. Meta Knight crouches and stabs. It's... ehhh... weak, but is even faster than most of his attacks, can trip, and can combo with several other moves (especially if it trips). Meta Knight slashes horizontally with a heavy swing. Sure, it's his most powerful attack, but the start-up lag is pathetic for him. It's something you would only use in a moment of opportunity. His Up Special and Down Smash have impressive knockback as well, and you don't need to wait for your foe to slip up for them to be used either. It's quick. Its range is good. However, if the opponent is in a position to be hit by this move, Meta Knight generally has better options to use. Meta Knight-users will (and should) spam this early and often. It hits on both sides (good against rollers) and is obnoxiously fast. The behind strike is arguably his best KOing attack, but the forward strike isn't horrible either. If you ever, ever sidestep a close-range attack (especially a dash), it's never a bad idea to combo into this. It's a little tricky, but if you glide attack right before hitting the ground, then C-stick down, you can literally land into this attack. This is Meta's best option against bosses, if you can land both hits. Otherwise try neutral air. A flying kick. Like most dash attacks, it's predictable, though it does carry Meta Knight a long distance, making it harder to punish than most. It launches foes up, which can lead into aerials or juggling. Good for getting in the first attack, but there are better attacks in a sudden death situation. Surprisingly slow for Meta Knight. It may not seem so, but this is one of Meta Knight's strongest KOing attacks. When used out of Shuttle Loop, Meta becomes helpless. Like most floaty characters, Meta Knight can dish out plenty of damage when used right. However, his horizontal movement speed in the air is pathetic (one of the five worst when he isn't gliding), which makes it harder for him to approach while aerial. To get your foe in the air, Forward Tilt, Up Smash, and Forward Throw are likely your best options. He spins, much like Kirby's nuetral air, except better. You'll rarely connect with more than two hits, but 19% still makes it his strongest aerial. The first hit has surprising knockback, and opens amazingly fast. The drawbacks: the duration is long, its range is minuscule, and it has quite a bit of landing lag. It's a good KO alternative to Shuttle Loop or Down Special, but dangerous enough to where you wouldn't want to use it for damage often. Against bosses, you can usually get all three hits, making this a favorite. Triple slashes in front, and you'll always land all three. It's amazingly fast, decently damaging, and an overall a good attack. The landing lag is pretty small as well. What really makes this great is you can approach with it either in the sky or on the ground (via short-hop). You can also float off the edge when you've knocked someone off, hit 'em with this for the KO, then Shuttle Loop back towards the stage. Triple slashes in front, and you'll always land all three. It's amazingly fast, decently damaging, and an overall a good attack. The landing lag is pretty small as well. It's identical to his forward air, but you can't easily approach with it. An overhead slash. Six percent may seem low, but this move is obnoxiously fast: start-up, duration, and after-lag might as well be nonexistent, even more so than with his other moves. It's a good juggler, but that seems to be all its good for. It's easy to jump-Uair repeatedly, but half-decent foes can usually DI or dodge out after one or two hits. Arcing slash below him. This is the safest move in the game, and also the best at gimping. If you hit in the forward-bottom quadrant, this works as a weak spike. If you hit in the behind-bottom quadrant, the foe will usually be pushed back on the stage. Always use it to spike and edgeguard, but avoid it otherwise. Meta Knight's throws do decent damage for throws, and compared to his other moves, but don't expect to get KOs out of them. Each of his grab-hits are slow, but do 3% damage. They are overall good attacks. He holds the foe in place, then kicks. It knocks your opponent into the air, much like forward tilt, which can open for some aerials or Shuttle Loop. If you're just looking for pure one-hit damage or knockback, this is your worst choice. He holds the foe in place, then slashes. Of his throws, it has the most knockback, but looking to kill with this would be foolish. He rockets into the air with the foe in-grip, then crashes back down. This dishes out the most damage. Since he leaps off the stage, this is the safest throw in a FFA, and can be used to KO off a moving platform. Meta Knight lays his foe on the ground, then hits them repeatedly. It does one point less than UpThrow, but can leave your foe in a more favorable position at lower damages, closer to you. Since Meta Knight and his target remain in the same place longest with this, he can be punished in FFAs, but your ally can punish him in Team Brawls. He spins around wildly, creating a vortex that damages anyone and anything that gets caught. Repeatedly mash B to make the vortex last longer; the more often B is mashed, the higher Meta Knight will float. Exiting this move in mid-air makes him helpless. Meta Knight's Neutral special move is great for pumping up an opponents Damage, especially if your opponent is a large character such as Bowser or Dedede as they find it harder to escape the Tornado. If you find yourself in a big crowd, this or a down smash is your best option. He spins around and rushes forward. This move can also be used for recovery. He loops around in mid-air, and then glides down. The up-swing of this move strikes foes; amazing start-up speed, and takes him out of the danger zone immediately (sometimes even able to escape Ike's/Marth'/Lucario's counters). He disappears, then reappears a short distance off in any desired direction. Holding the attack button can release an attack upon re-entry, but the attack has significantly greater after-lag than just re-appearing. The re-entry slash is one of his most powerful moves, but it opens and exits so slowly that cleanly trying to hit with this can be even more difficult than with Forward Smash. This can be used to refresh ledge guard invincibility, but his double jump can be just as effective. Meta Knight wraps his cape around himself and spins into a thin cylinder before reappearing momentarily. + ( or )+ or or Meta Knight says, "Fight me! ", slashes his sword twice, then points his sword at the opponent. + Meta Knight opens his wings twice, shouting, "Come!" This is vaguely similar to a pose he took in Kirby Super Star. Galaxia Darkness: Meta Knight swings his cape. If you don't hit, nothing happens, but if you hit the enemy…behold. All the stage turns into shadows and Meta Knight launches the enemies away with one slash. The slash can hit multiple enemies, even ones not caught by his cape. Note that if Meta Knight used his Final Smash on an enemy firing a Super Scope, that enemy will hold out their arms in a T pose, just like with moveset swap hack. Another note for this Final Smash is that if a member of your team is hit with the weaker slash part of the Final Smash, the team member will be affected and/or KO'ed, even when Friendly Fire is off. This final smash also has considerable knockback, not like Marth's, but still can blast people off the stage. Best knockback comes from the middle of the cape, in front of Meta Knight. If the cape goes through the middle of your target, that will probably lead to a clean KO. Zero-suit is much more unpredictable that her armored counter-part, and in the right hands, can easily make you the laughingstock of your community. Starting off the game with items that she was wearing on her body moments ago leaves you at a crippling disadvantage, as now she can get nice and close while you're stunned from that stupid shoulder pad that just nailed you in the facemask. Oh look, you just took damage and lost momentum. Her ranged whip, bring amazing recovery and distance attacks, can do a number to your recovery game. Her down smash, with its paralyzing effect, can almost always be a KO. It is commonly used for Edge-guarding. You have been warned. However, it is in your wings and recovery that you take priority. Your tornado will keep her defensive, and up-slashes are a great tool to stay airborne while predicting some damage. Zero-suit is also deadly with her ranged weapon, as she can follow it, and quickly bring in her whip as it phases out. While you need her close, make sure you're the one who controls when the attacking happens. Surprisingly, Mr. Game and Watch is considerably fast. He also has the advantage of moves with extreme knockback. If you go up against this guy, beware of his fishing helmet or his double-hammers. If you are going against a professional Game and Watch character, he is only very slightly' slower than Meta Knight. Be cautious against him no matter how good you are. Beware of being aggressive against G&W. If he approaches with any aerial you can up special out of shield or right before it hits you (because your up-special has invulnerability if it's used on the ground). Up-tilt beats his key and your f-air does not beat turtle. Should be easy. Meta Knight should be effective as long as he evades Kirbys Stone attacks and Hammer attacks. Kirby is a lightweight character so do smash attacks when possible. Kirby cannot punish retreating f-airs. D-air camping is effective. Your tilts out-range his everything (except for his f-smash), though his f-smash beats your tornado. Ike's attacks are much stronger than Meta Knight's, but they are slower. Shield when necessary. Watch out for forward aerials as they will outrange all of Meta Knight's attacks. Down throws are very effective against Ike because he can only airdodge or double jump right after it, or risk getting grabbed again. When Ike is about to do his up special, get out of the way because there's no easy way to counter it, plus it does around 15% damage. Down air and shuttle loop are especially powerful against Ike offstage because he doesn't have a good diagonal recovery. Don't be afraid to be aggressive when you push him off the stage because he doesn't have lots of options. Wolf's game is similar but inferior to Meta Knight's. The move Wolf uses most is his laser projectile. It is not as fast as Fox's or Falco's laser, but is more powerful. If Wolf is less skilled, he will likely use multiple forward smashes. He will use down smash to kill you, which can get you if you're on the ledge. Jump over the lasers and shield otherwise. Since he's a fast faller you could chain down throw to down throw or up aerial to up aerial at low damage. When you get him offstage, prevent him from recovering by using neutral aerials, rising down aerials, and up special. This page has been accessed 108,525 times.